Thanks to ultra-high sensitivity of ISO 409600*, the SNC-VB770 4K network camera features top levels of minimum illumination of less than 0.004 lx - to capture exceptionally detailed 4K/30 fps colour video, even at night and in similar extreme lighting environments. Thanks to the ultra-high sensitivity of expandable ISO 409600, the SNC-VB770 features a minimum illumination of less than 0.004 lx to capture exceptionally detailed 4K/30 fps colour video, even at night and in similar extreme lighting environments. The SNC-VB770 uses the 35 mm full-frame Exmor sensor, which is developed based on Sony’s most advanced image processing technology. The sensor captures significantly more incident light than conventional camera sensors to bring drastic improvements to the sensitivity. The camera also uses a Sony-developed image processing engine to achieve extremely high sensitivity and low noise at the same time. Area-specific noise reduction selectively divides the image into areas based on patterns (such as edges, textures and evenly coloured areas like blue skies) to efficiently reduce noise and improve image quality. Detail reproduction technology helps to accurately depict details with a more natural sense of dimension. E mount lenses maximise the performance of the 35 mm full-frame sensor, keeping high resolution across the entire image area from the centre to fringe. Intelligent Cropping gives a wide area situational overview of the whole scene and a closer view of specific areas of interest at the same time. Operators can see the whole scene with Full HD resolution, plus up to four VGA cropped image areas. This allows more efficient management of network bandwidth, reducing data storage requirements by up to 50% compared with conventional solutions. In addition, Multi Tracking can recognise and dynamically track multiple subjects in these separate windows. This can reduce the risk of missing suspicious activity, letting operators see unidentified subjects as cropped images whenever they come into the frame. Intelligent Coding optimises efficient management of network bandwidth while maintaining 4K resolution where it’s needed. It gives selected of-interest areas maximum detail, while reducing bit-rates in the other areas of the image to save network bandwidth by up to 50% and minimise storage costs compared with conventional network cameras. Enjoy the best picture quality in any scene, any time of day or night without adjusting camera settings. Intelligent Scene Capture automatically selects optimum picture settings responding to environments such as weather, time, and lighting conditions and providing the best picture quality for the scene. Picture settings can also be adjusted manually, or set according to time schedules. High quality, ceiling microphone for IP security cameras. Discover the awards and certificates our network cameras have received. Discover our latest ultra-high sensitivity technology which is revolutionising security in cities. 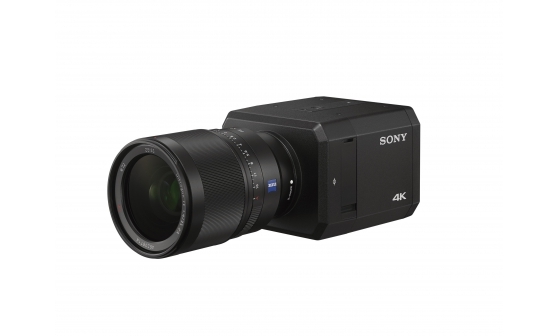 Sony offers complete 4K security solutions that deliver better pictures - and generous returns - on any budget. Our ultra-sensitive SNC-VB770 4K camera captures crisply detailed Ultra HD video footage where other cameras struggle.